I know it seems like all I do is travel these days–which I wish were the case!–but life’s been a bit nutso in-town, so there hasn’t been much cooking. Two weeks ago, though, I was lucky enough to drive up to New York City to see David, a fantastic friend who I haven’t seen since 2008. 2008! How is that even allowed? Thankfully, it’s not a long drive to the city from Roanoke–8 hours or so, depending on traffic–so G & I combined seeing David with Guided by Voices playing at the Northside Festival in Brooklyn. In order to make it up to Brooklyn with plenty of time to explore, we headed out of town on a Thursday with the plan to spend the night in Allentown, PA. That way we’d have most of Friday to putz around Williamsburg. Before we hit the road on Friday, though, we needed to catch breakfast. 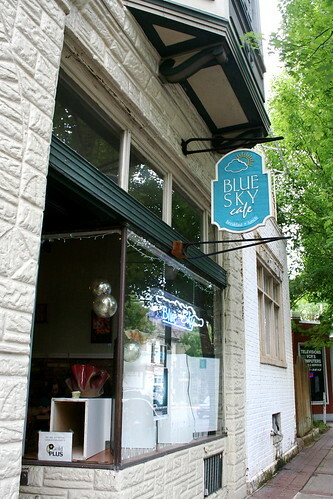 Say what you will about Yelp, I’m glad it’s around, because it helped me find Blue Sky Cafe in Bethlehem, PA.
Blue Sky is a breakfast and lunch diner in downtown Bethlehem and, in my book, qualifies as super awesome. MGMT was playing on the stereo when we walked in and fried egg reubens are the menu. What more could I want? We opted to sit at the bar which gave us optimal line-cook viewing and it was fun to watch the guys schlep eggs and tend to a giant turkey breast roasting for lunch. Over all, the interior is cozy-industrial with plenty of natural light. For breakfast, I ordered the fried egg reuben. Of course. Delicious, tangy rye bread (done right up north, thank you) with a runny, runny, explodes-in-your-face fried egg, thousand island dressing, and sauerkraut, the sandwich is amazing. I can only imagine it’d be the world’s most perfect hang-over food. Did I mention amazing, runny yolks? One really did explode when I bit into it. A bit of adventure for the meal! The only drawback is that it is extremely messy–but messy in the best way. G ordered a basic plate of scrambled eggs, rye toast, potatoes, and kielbasa. The kielbasa stole the show–I don’t know if it was the quality of the sausage or the way it was cooked, but even G thought it was the best one he’s ever had–and he grew up on the stuff in Pittsburgh. The scrambled eggs & potatoes were great too, but the poor rye toast went essentially untouched given the portions. Hooray diner! That sandwich looks epic. 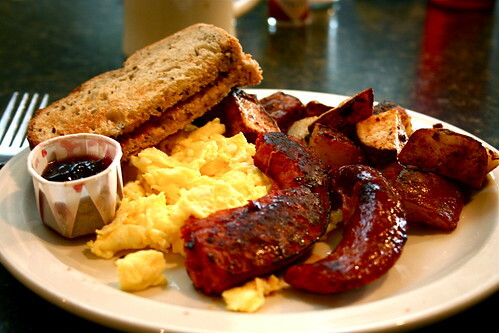 The kielbasa is particularly interesting, since they normally aren’t around in diners. It seems like it could be a regional thing, considering the PA Dutch/German history in that area, yes? This is totally making me flash back to a particular awesome experience 15 years ago at German restaurant somewhere off 77 in eastern Ohio. 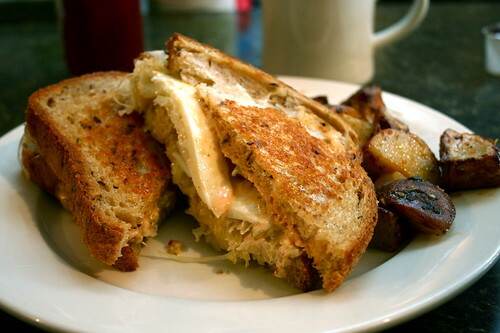 A reuben sandwich is one of my favourite things, and one of the few things I miss from my meat-eating days. I usually sub a portobello mushroom for the meat but the fried egg idea is pure genius. I’m totally going to try replicating this sandwich. Also a good excuse to practise my sourdough techniques. Need to buy rye flower, caraway seeds and sauerkraut. Perfect hangover food, yes, but I probably won’t wait for a hangover to give this a go. Did it have cheese? Yup, there was cheese, Swiss, I think? Whatever the cheese is that you normally put on one Making sourdough is high on my list too, maybe in the fall when bread baking doesn’t sound quite as crazy hot!